1B Umpire Angel Hernandez ejected White Sox Pitching Coach Don Cooper for arguing a balk call in the top of the 6th and 3B Umpire Ted Barrett ejected Blue Jays Manager John Gibbons for arguing a foul ball call by HP Umpire Gabe Morales in the top of the 9th inning of the Blue Jays-White Sox game. In the 6th, with one out and one on (R1), White Sox pitcher Carlos Rodon was called for a balk. Replays indicate Rodon, pitching from Set Position, did not appear to come to a complete stop pursuant to Rule 5.07(a)(2) and 6.02(a)(13) before delivering his pitch to Blue Jays batter Troy Tulowitzki, the call was correct. Play was reviewed and affirmed by the UEFL Appeals Board, the call was correct. * In the 9th, with one out and none on, Blue Jays batter Darwin Barney attempted to strike a 1-2 knuckle curve from White Sox pitcher David Robertson, the ball bouncing away from catcher Alex Avila and into dead ball territory. Initially ruled a swinging strike by HP Umpire Morales, upon consultation amongst the umpires, Morales ruled the play a foul ball. Replays indicate Barney's bat made contact with the pitched baseball, the call was correct. At the time of the Cooper's ejection, the White Sox were leading, 2-1. At the time of Gibbons' ejection, the White Sox were leading, 3-2. The White Sox ultimately won the contest, 3-2. This is Angel Hernandez (55)'s first ejection of the 2016 MLB regular season. This is Ted Barrett (65)'s first ejection of the 2016 MLB regular season. Angel Hernandez now has -1 points in the UEFL Standings (-5 Previous + 2 MLB + 2 Correct = -1). Ted Barrett now has 6 points in the UEFL Standings (3 Previous + 2 MLB + 1 Correct-Crewmate = 6). Crew Chief Ted Barrett now has 2 points in Crew Division (0 Previous + 2*[1 Correct Call] = 2). *OBR 5.07(a)(2) states, in part, "The pitcher, following his stretch, must (a) hold the ball in both hands in front of his body and (b) come to a complete stop. This must be enforced. Umpires should watch this closely. Pitchers are constantly attempting to “beat the rule” in their efforts to hold runners on bases and in cases where the pitcher fails to make a complete “stop” called for in the rules, the umpire should immediately call a “Balk.”"
*OBR 6.02(a)(13) states, it is a balk when, "The pitcher delivers the pitch from Set Position without coming to a stop." This is the 81st, 82nd ejection report of the 2016 regular season. This is the 32nd Manager ejection of 2016. This is Chicago's 6th ejection of 2016, 1st in the AL Central (CWS 6; MIN 5; DET 4; KC 3; CLE 1). This is Toronto's 11th ejection of 2016, 1st in MLB & AL East (TOR 11; BOS 4; BAL 3; TB 2; NYY 1). This is Don Cooper's first ejection since August 7, 2013 (Greg Gibson; QOC = Y [Balls/Strikes]). 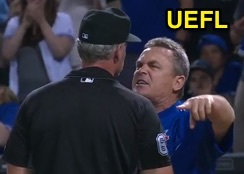 This is John Gibbons' 5th ejection of 2016, 1st since May 22 (Joe West; QOC = Y [Balls/Strikes]). This is Angel Hernandez's first ejection since March 12, 2016 (Stolmy Pimentel; QOC = U [Throwing At]). This is Ted Barrett's first ejection since July 29, 2014 (Ron Gardenhire; QOC = Y [Replay Review]). Wrap: Toronto Blue Jays vs. Chicago White Sox, 6/24/16 | Video available via "Read more"